Local Area Wardens have been assigned to provide a valuable link between the Local Disaster Management Group (LDMG) and that specific area. The Local Area Warden is to assist in the response to a natural disaster emergency by providing information to the LDMG on how the locality is coping, assisting in co-ordinating food and medical supplies, and providing the community with up to date information on the state of affairs. Residents can contact their Warden should they have anything to report or require any assistance. The Wardens can either help them with their enquiries, can contact the LDMG direct, or advise what avenues the residents can take to meet their requirements. People in a specific area (e.g. Lucinda area) can contact their Local Area Wardens (e.g. Mr. Andrew Carr) who will be the liaison between their area and the Local Disaster Management Group (LDMG) during emergency situations. Please note that residents can also contact the SES on 132 500 for information or assistance. 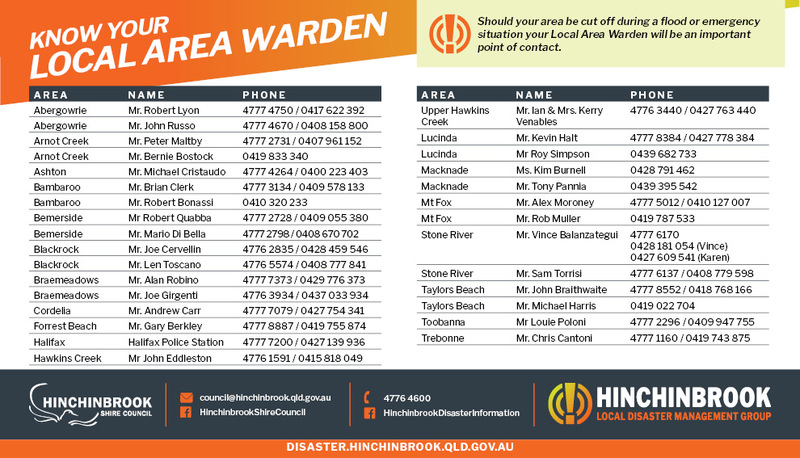 Download the Local Area Warden contact list here.